The Life of Bon: J. Crew and Forever 21 and who's the smartest shopper ever?!? J. Crew and Forever 21 and who's the smartest shopper ever?!? Hold on to your seats girls because today we are talking about SKIRTS! Skirts skirts skirts. Can life get any more exciting than this? I submit that it cannot! 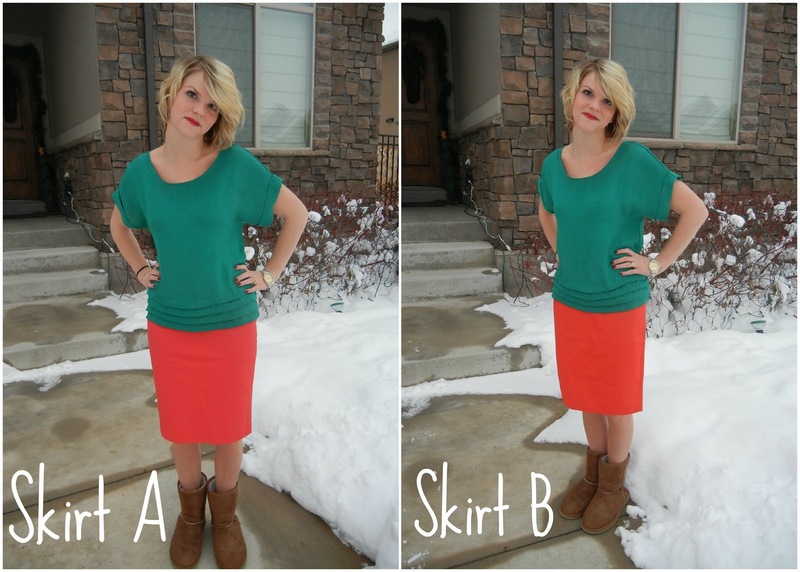 This Christmas I really wanted a brightly colored skirt. I'm getting real sick of my drab black and gray skirts at school. I needed something to liven up the next three months of drear I'm looking at! (January, February and March, I will always hate you.) I really wanted this skirt to be from J. Crew. I have never owned anything from that store and I recently became obsessed with it after I started following this blog. Everything she wears is from J. Crew and she looks fabulous all the time. Basically I see Crew to the J. as the beautiful, rich store that I can not afford. But I was determined this Christmas. Even if it meant I only got one thing for Christmas- it would be from J. Crew! Lucky for me, J. Crew opened up an outlet store close to where I live. So I skipped on down one Saturday with mi madre in tow and found immediately what I was looking for. Bright coral skirt, pencil, absolutely gorg! So I said, "Hey mom! I want this $50 skirt! Even if it's my only gift for Christmas- I want this skirt!" And she said okay but I think it's over priced and get ready to spend money on a dry cleaner. And that was it. My Christmas from my mom would be one fabulous dry clean only coral skirt. A week or so later I was casually strolling the aisles of my favorite cheap clothes go to, Forever 21, when what did appear? Didst my eyes deceive me?!? It was an almost identical skirt as the J. Crew skirt only this one was only $17.50! I tried it on. Fit perfectly. Coral. Pencil. Fabulous. And this one WASN'T dry clean only. Who's the smartest shopper in the world now?!? I admit I was sad to have to give up my one and only J. Crew purchase, but I just decided I will never be a J. Crew kind of girl. Why spend $50 when you can spend $17 and that's just the way the cookie crumbles in my book. Or something like that. Now. Let's play a little game. Here are the two skirts. Can you guess which one is from J. Crew and which one is from Forever 21? Please disregard my pasty white legs. It's winter. You understand. SKIRT A is the $17.50 skirt. Who would have thought my love affair with J. Crew would end before it ever began? But I guess when it comes down to it there are only two types of girls in the world- those who can stand to spend $50 on skirts and those who can't. Looks like I'm sticking in the can't category! Happy new coral skirt and 2013! Wow - my guess was totally wrong. I'm a terrible guesser. I too love Forever 21 and even though it's inexpensive, it always makes me wish I were made of money so I could buy all the things in there. I guess I'll stick to my thrift stores... haha. You're a cutie and looks like someone has become a budding fashion blogger. This is such a great post, there is nothing wrong with buying lower costs and getting more for your money. At the end of the day (most) of us women only wear things a few times and that's when low cost and disposable fashion is great. Ah, I have to totally agree. I can never justify the cost of J. Crew. Congrats on your awesome finds! Deals like that are the best! I am so impressed! I find there's usually a "knockoff" that's exact or at least similar to the more expensive brand. I usually end up getting frustrated if I can't find one though and end up getting the more expensive version. I really need to work on my patience and impulse purchasing. :s Great find though!! I couldn't agree with you more. I love the skirts! And...we just might live near each other. Traverse Mountain outlets? I live right over there! Happy New Years! I've stopped buying clothes because I'm so fat (some call it pregnant, but whatever) but I'm super excited to hit up F21 again once I'm skinny again (hahahaha!! That wont be for a looooooong time) I'm amazed at the great deals you found. Seriously, you are a good shopper!! The only thing I would say is that the J Crew skirt would hold up better in the long run. But, if you weren't planning on wearing the skirt all that much then I would go with Forever 21! I would never buy anything full priced at J Crew & definitely always look for sales & coupons. I make sure that what I get there are classic pieces that will last a while so I get my $ worth. If it's a pretty trendy piece, I'd try to find it somewhere cheaper! i love smart shoppers. ;) you can't even tell the difference! nice work!! Awesome post! You convinced me, go for the cheap stuff. I also read your dot com post, totally going to get my own domain! I was afraid it wouldn't redirect people from my old address, but now I know that it does-I'm all game. Thanks for following on my blog, you are the sweetest! I'm so glad you're enjoying it :) Also, Deidre is a sweetheart, and her posts are always so entertaining. Cute steals! But hear comes the a good question for the F21 vs JCrew argument....that same skirt in two years. 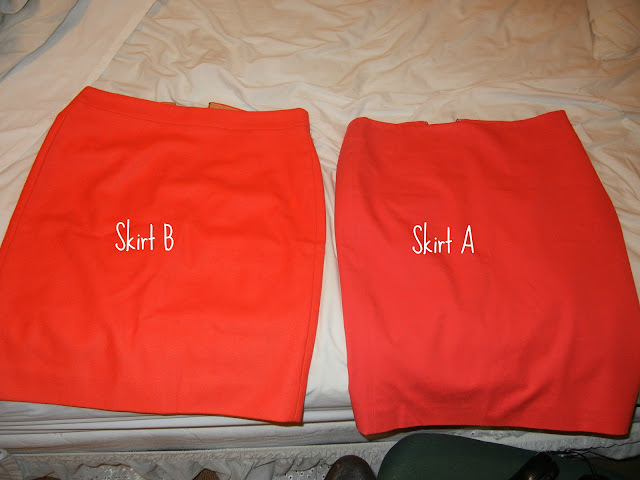 Can almost put money on the fact that your F21 skirt will be done with but the JCrew one will still look hot! That's why I'm a fan of mixing inexpensive and quality- F21 for trends and more money for staples that I need to last for more than a couple months! Either way, you're looking good and BRIGHT...I love color and you do color well! Total score! I always tell myself I will only invest in quality clothes, and then I find cheaper stuff ALWAYS at Target and F21 that looks the same. I love getting lots of little things, too. Love these pics and the comparisons...you crack me up. hahaha. you are so great bon. i love jcrew though, i cant help it, however i wouldn't ever pay $50 for an item. haha. instead i wait until they are cheap as possible. i think i got that same skirt for $20 at the outlet. however, if i am ever filthy rich i will pay the dang $50 for that skirt.